The Lava Cast Forest is a fascinating sight south of Bend, where ancient trees were permanently cast in lava following a volcanic eruption nearly 7,000 years ago. Located just 26 miles south of Bend in the Newberry National Volcanic Monument. Accessible from the middle of May through the middle of November. Explore the fascinating lava trees, created 7,000 years ago when they were engulfed by the hot lava that erupted from the Newberry Volcano. Not far south of Bend is a spectacular lava forest, known as the Lava Cast Forest. Formed approximately 7,000 years ago when hot molten lava flowed from the nearby Newberry Volcano, the landscape holds lava casts of the ancient trees that were growing there at the time. Over the years, Ponderosa pine, penstemon flowers, and Indian paintbrush have flourished in the rocky terrain adding life and beautiful splashes of color to the landscape. To reach the Lava Cast Forest from Bend, head south on Hwy 97 for about 15 miles, then go east on F.S. Rd. 9720 for about 8.6 miles. Take F.S. Rd 9720 950 south for a little over a half mile to the forest. You can usually access the area from mid-May to about mid-November. Contact information: Deschutes National Forest, 1001 SW Emkay Drive, Bend, OR, 97702. Phone: 541- 383-5300 or 541-593-2421 (visitor center). Visit the website here. Interpretive trail – Take some time to explore the self-guided interpretive trail, which is about a mile long. Lava Butte – Hike up nearby Lava Butte and enjoy spectacular views of the Cascade Range and the beautiful landscape of central Oregon from the summit. Newberry National Volcanic Monument – Covering over 55,500 square miles, this monument provides plenty of opportunities for camping, hiking, mountain biking, fishing, horseback riding, river rafting, snowshoeing, and cross-country skiing. 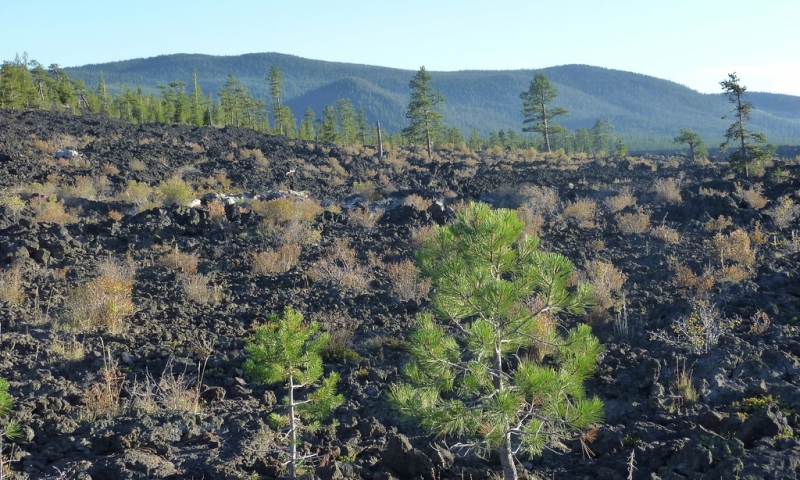 The elevation of the Lava Cast Forest is 5,750 feet. Walter Perry, an employee of the Forest Service, discovered the area back in 1925. Although the word “cast” is used, the lava trees are technically molds, not casts.